Carmen supposedly owes the money to an antique book-seller. Prior to visiting his bookshop, Marlowe swots up on rare books at the Hollywood Public Library, where he consults a copy of Famous First Editions (a book which doesn’t exist in the real world). Fedoras and trenchcoats were evidently not the library-goer’s usual attire in mid-forties Los Angeles. The bespectacled blonde to whom Marlowe returns the book accuses him of not looking like a bibliophile (a fellow Cambridge librarian once told me that my tie was unsuitable for a College library – unfortunately she looked nothing like Carole Douglas). 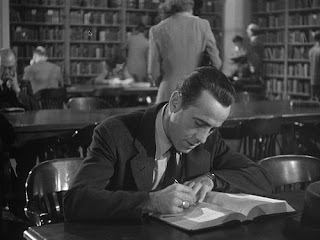 By referencing his atypical clothes, the librarian subtly undermines a set of prejudices audiences might have about Bogart’s character. Three years earlier he had played Sam Spade - a darker, colder, more obviously flawed private eye - in John Huston’s version of The Maltese Falcon. The brief library scene, while advancing the plot, also sets Marlowe apart from more traditional hard-men. It's difficult to imagine Spade in a library. Bogart can go to the library and lose none of his cool. But the library gains by the association. In a playful twist, the studio used the library to promote the film. As if to taunt the film-addled French postmodernists who were teenagers when this film was released (Cahiers du Cinéma critics later referenced the film constantly), the trailer featured Bogart asking a different librarian for help choosing his latest read. 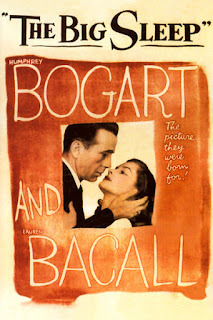 When he confesses to being a fan of the Maltese Falcon, she offers him a book that has “everything the Falcon has and more, Raymond Chandler’s latest bestseller [it wasn't], The Big Sleep.” Bogart starts reading the opening lines, the library fades, and corpses, gunshots, car chases, fistfights, and long, loving close-ups of Lauren Bacall fill the screen. So, Bogart and Bacall sharing cigarettes and witty dialogue. A screenplay co-written by William Faulkner based on a Raymond Chandler novel. And Hollywood Public Library - what a job that would be! Easily the best film made of a Chandler book, with Bogart the definitive cinematic Marlowe. The acting is superb in this film. This movie is almost Bond-like in terms of the number of appallingly beautiful women Marlowe accidentally encounters, all of whom seem to have a burning desire for him.